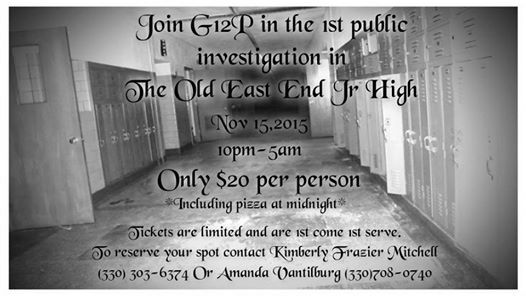 Now that our Halloween season is over we can invest some serious time into the East End Jr. High. We have a lot of questions to answer and much research to do yet. But I can tell you that something is there. The old shop room has a dark figure that many on the crew was able to see. The boiler room also has some paranormal issues. There is a room of the gym that is looking interesting and so is the stage. Our first public adventure here is November 14 and we are excited about it! The cost is $20 per personand goes from 10pm to 5am. Pizza will be served at midnight. We are working on a video this week of what we have so far, including a very good EVP of Amanda's name. She was amazed, considering where it happened. The date for this event it Saturday, November 14. We will be there to hunt with you or you can go out on your own! If you want to book a private evening, it is $250 for up to 20 people.